Chapman (Vegetables in Underwear, 2015) is back with digital illustrations featuring anthropomorphic fruits. The front endpapers identify each fruit by name (pineapple, grapefruit, cherry, apple, etc.) as it stands fully clothed, looking uncomfortable, especially a squalling baby pomegranate; the rear endpapers show the same fruits looking comfortable and happy in their swimsuits. Most of the vividly colored fruits shown are common and familiar, and most of them are wearing swimsuits (both the boy and girl kind), but although the all-caps text points out that “there are all kinds of suits,” it does not identify any of them by name, just by style or function. Oddly, there is not any mention of the word “swimsuit.” The cheerful strawberry narrator, wearing a red-and-green polka-dot swimsuit, explains to the grapefruit wearing a business suit that “If you want to go swimming you need a suit.” Although the picture of the baby pomegranate swimming in her “birthday suit” will elicit some giggles, kids may find it difficult to differentiate between a suit “for sunbathing” and a suit “for the shade” (for the shade? 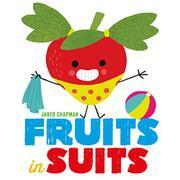 ), a suit “for scuba” and a suit “for surfing” when worn by a brightly colored cartoon fruit with stick arms and legs.